In their new book, Boston College alumna Margaret McLean and award-winning investigative reporter Jon Leiberman offer an insider’s view of the trial of notorious Boston mobster James “Whitey” Bulger. McLean, a former prosecutor and legal analyst, attended every day of the Bulger trial. 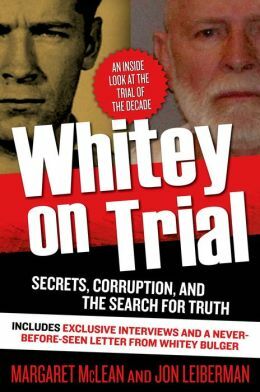 Whitey on Trial (Forge Books, 2014) is based on trial testimony and interviews with cops, FBI agents, prosecutors and defense attorneys, and members of the jury that ultimately found Bulger guilty on 31 counts, including 11 murders. It also includes a letter from Bulger, which offers insight into his state of mind immediately following the verdict. McLean teaches law at Boston College’s Carroll School of Management. McLean was interviewed about the book by the Patriot Ledger. This entry was posted in Alumni Authors, Boston College Authors and tagged Carroll School of Management, crime, legal case, nonfiction. Bookmark the permalink.